With just a few days to go ’til our massive Goodgod Birthday Nights, we enlisted illustrator/musician/renaissance man Ben Montero to put Saturday’s Smash Hits! lineup into one incredible poster… and good lord, did he come through with the goods! Click here to see the poster in its full glory, and be sure to come down on Saturday night – the first 50 through the door will get a shiny A3 copy to sick on the fridge! 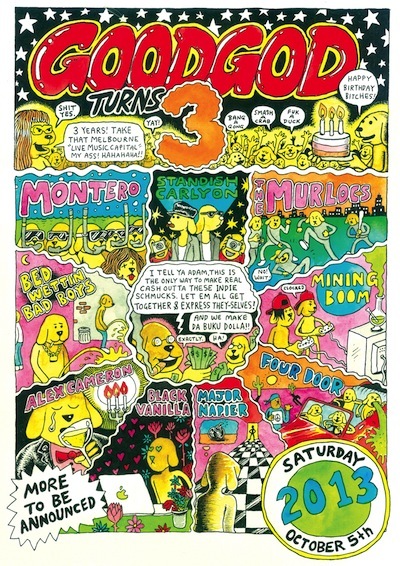 And don’t forget to get your tickets to Goodgod Birthday Nights, featuring Montero and his band, as well as Standish Carlyon, The Murlocs, Black Vanilla, Zanzibar Chanel, Nina Las Vegas vs Levins, Jimmy Sing vs Mike Who, Siberia Presents The Goodgod House Band and heaps, heaps more!